My momma is a yard-aholic. Not that it was her intention to be such, but in Montana....yards can be BIG. And hers is no exception. I was pretty sure that she had all the same tools that I was forced lovingly encouraged to use when I was kid working in the yard. 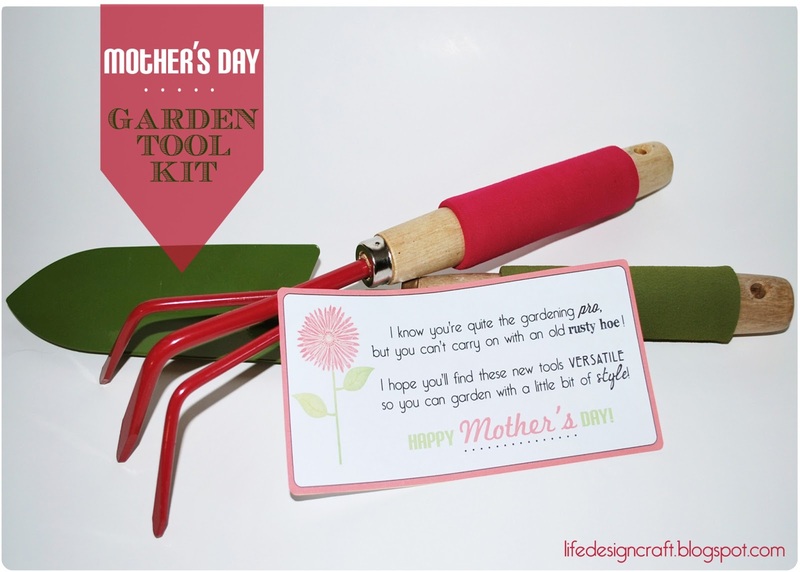 Mother's Day was a great time to bring some color and shine to her garden tool collection! This is a simple, but versatile gift idea because you can give just a couple or a big variety of fun gardening tools! There's no shortage of colorful gardening tools and they are super inexpensive. I found these tools at Michael's and wrapped them up in a cute package to mail home. but you can't carry on with an old rusty hoe! so you can garden with a little bit of style! You can snag my little printable below. Happy Mother's Day to all you wonderful mothers out there (but MY mother especially)! Thank you for providing the information regarding inexpensive garden tools.This is a simple, but versatile gift idea because you can give just a couple or a big variety of fun gardening tools! There's no shortage of colorful gardening tools and they are super inexpensive.